In a large skillet, heat the olive oil over medium heat. Sauté the onion, stirring it, for 3 minutes. Add the farro and stir well. Add the vegetable broth, white wine, salt and pepper. When it comes to a boil, cover and lower the heat to its lowest setting. Cook for 35 minutes. Uncover and add the mushrooms. Combine well and turn up the heat until it comes to a boil again. Cover, lower the heat and cook for another 15 minutes. Turn off the heat or, if there's still a lot of liquid, turn up the heat and let it boil, uncovered, until the liquid evaporates almost completely. Add the cheese and the spinach. Stir well until the spinach is cooked and the cheese has softened. 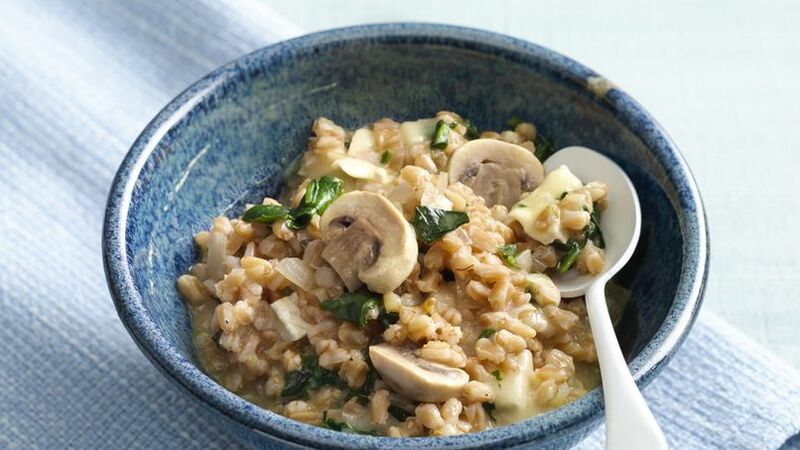 This risotto can be made with rice, wheat or quinoa. The cooking time will have to be adjusted depending on the ingredients. Instead of spinach, you can use Swiss chard or kale. You can use Parmesan cheese instead of Brie. Morena Escardó Just about everyone likes risotto because it's such a versatile dish. Its variations include meat, chicken, seafood or vegetarian with all kinds of vegetables. You can use the traditional Arborio rice or you can try quinoa, wheat or farro, as I've done in this case. It can be served both hot and cold, and you can even fry the leftovers and make burgers, just to give you an example. In the risotto world, your imagination has no limits. Some risottos are pretty creamy, but you can also make risotto that's actually more like pilaf. In this case, risotto makes the perfect lunchbox meal for work or even a picnic, because it is easy to transport, can be enjoyed even when it's not too hot, and goes well with all kinds of salads and sides. A nice idea to celebrate Mother's Day is to have a picnic with the whole family. What could beat enjoying the first rays of sunlight and seeing the first flowering trees bloom while enjoying good food and even better company? Risotto is the perfect dish for this occasion, because it can be served with all kinds of appetizers and salads. It also goes perfectly with a barbecue outdoors.